<strong>An Academy Award-nominated actor and a renowned human rights activist team up to change the tragic course of history in the Sudan--with readers' help.</strong><br /><br /> While Don Cheadle was filming <em>Hotel Rwanda</em>, a new crisis had already erupted in Darfur, in nearby Sudan. In September 2004, then-Secretary of State Colin Powell termed the atrocities being committed there &quot;genocide&quot;--and yet two years later things have only gotten worse. 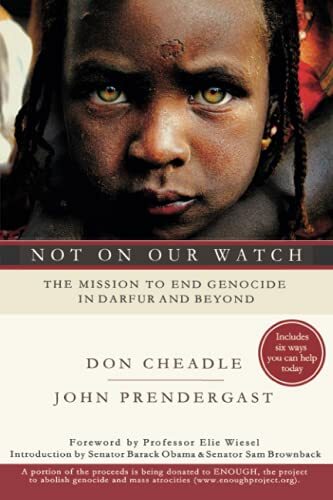 3.5 million Sudanese are going hungry, 2.5 million have been displaced by violence, and 400,000 have died in Darfur to date.<br /><br /> Both shocked and energized by this ongoing tragedy, Cheadle teamed up with leading activist John Prendergast to focus the world's attention. <em>Not on Our Watch</em>, their empowering book, offers six strategies readers themselves can implement: Raise Awareness, Raise Funds, Write a Letter, Call for Divestment, Start an Organization, and Lobby the Government. Each of these small actions can make a huge difference in the fate of a nation, and a people--not only in Darfur, but in other crisis zones such as Somalia, Congo, and northern Uganda. Over the past five years, youth groups, religious organizations, politicians and individuals have responded to the crisis in Sudan in increased numbers. This book is a guide for these already involved, as well as those who are interested in taking action, or speaking out against the mass killings that continue to occur in the country's Darfur region. Coauthored by Cheadle, actor and star of the film <i>Hotel Rwanda</i>, and Prendergast, senior adviser of the International Crisis Group, the book is a pastiche of practical information, instructions, memoir and history. As a handbook for budding activists, it's informative and, at times, inspiring. The combination of charts, lists and first-person accounts create a simple and reasonable path to action. But as a source for information about the conflict in Sudan, the book falters. The history is neither clear nor succinct, and there is not much of it. Furthermore, although Cheadle and Prendergast's personal anecdotes are entertaining, they overshadow the few anecdotes about the Sudanese living through the crisis. The book's most interesting moment, besides the useful advice on how to get involved, is its delving into the government's excuses for inaction. <i>(May 1)</i> <br />Copyright &copy; Reed Business Information, a division of Reed Elsevier Inc. All rights reserved.